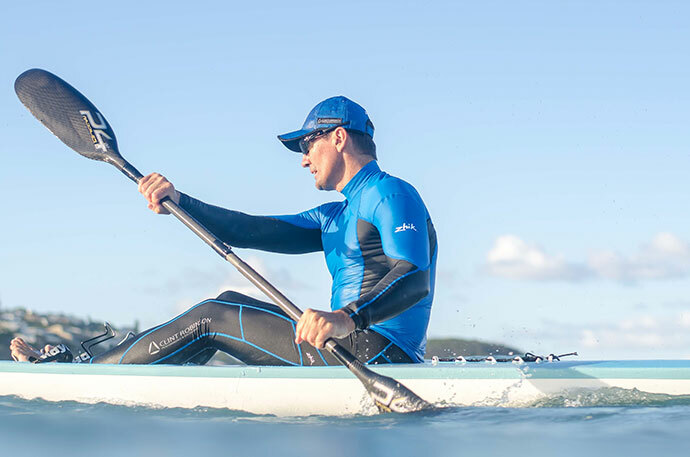 Attention adventurers — how often would you have the chance to glean hands-on paddling and running tips from multiple Olympic world champions and Australian sporting legends Clint Robinson and Steve Moneghetti; all the while getting the chance to spend a weekend on stunning Magnetic Island? 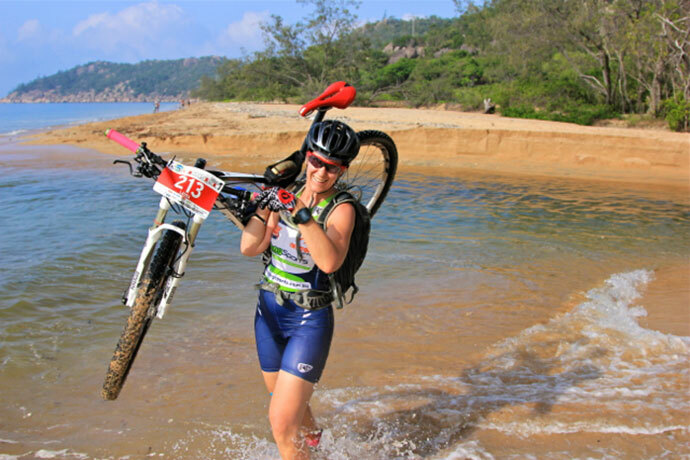 Say hello to Destination Adventure — an inaugural event devised by keen adventure racer and Maggie Island Bootcamp co-founder Daina Clark that’s about giving you the knowledge to set you up to unleash your best on the plethora of adventure events in North Queensland’s active calendar. We chatted to Daina to find out more about this February 12-14, 2016 event and what you can expect. What prompted you to organise the first ever Destination Adventure? Magnetic Island is such an adventurer’s playground with an awesome network of trails, beautiful beaches (some of which are only accessible by watercraft) and the rugged granite boulders — it is truly a destination for adventure! 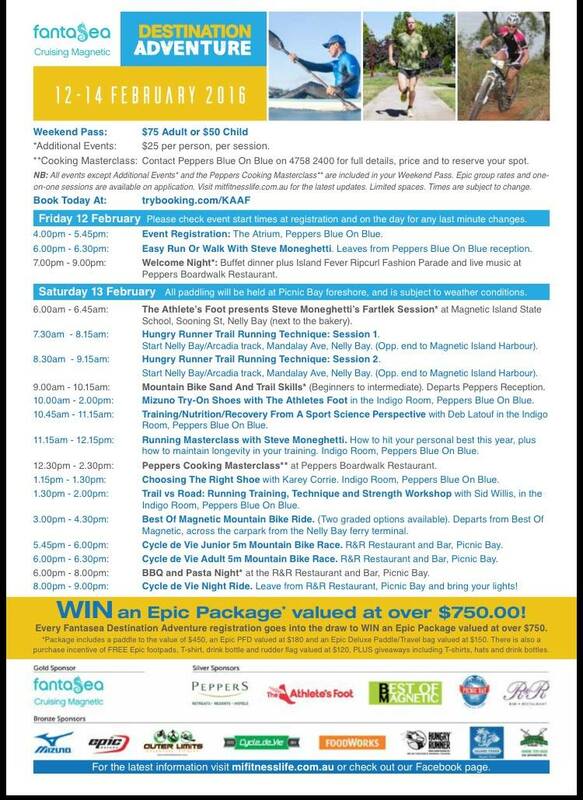 I have a love of outdoor activities and for Maggie Island, so this event is a chance to showcase them both. How did you manage to secure the likes of Australian sporting legends Steve Moneghetti and Clint Robinson? It’s amazing what can happen when you ask! I’ve heard from friends who have had lessons with Clint Robinson that he is an outstanding paddling teacher, so I sent him an email to ask if he’d come to the island to instruct a few sessions. He said yes. With the Adventurethon Magnetic Island only a month or so away, I then thought: ‘Wouldn’t it be cool if Steve Moneghetti could hold some running sessions too?’. So I sent another email and — with the help of our sponsors — next thing you know Steve is also coming to Destination Adventure! Is there something on the weekend’s itinerary for every adventurer? 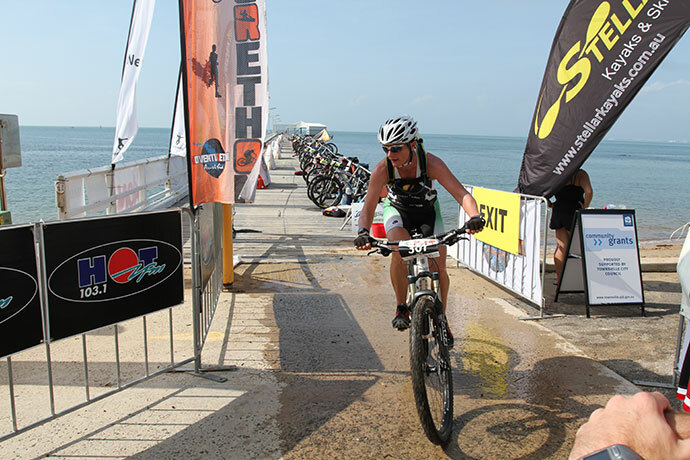 If you look at the program, it is absolutely jam packed with training/skills/seminars and workshops covering everything from trail running and paddling technique, lessons on gliding across the sand on your mountain bike; to choosing shoes, nutrition, and how to hit a PB in 2016. 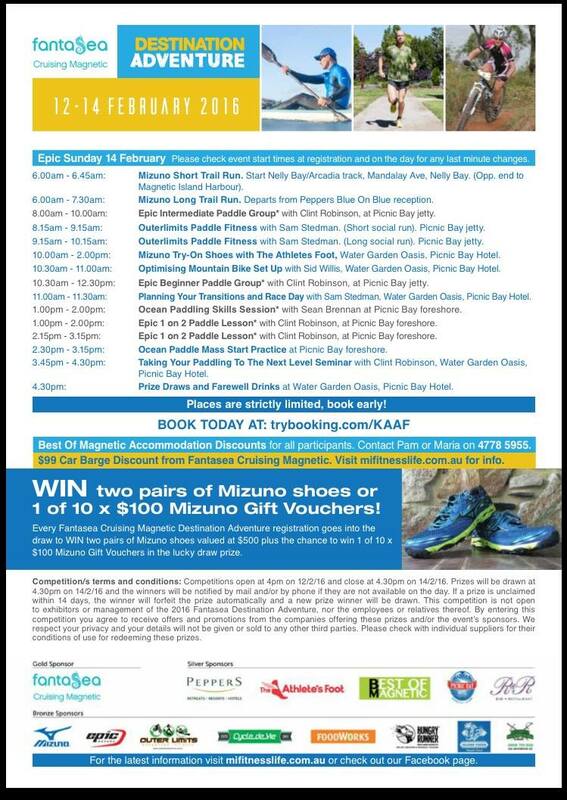 We also have cooking classes, Epic surf skis to demo and Mizuno shoes to take out for a trial run. So whether you’re into running, riding, paddling, or simply want a chef to teach you some healthy cooking skills, we’ve got you covered! The only problem will be choosing what you want to do. On a personal note, what are you most excited about? To have both Steve Moneghetti and Clint Robinson on Maggie on the same weekend is very exciting. Not only are they both taking skills sessions, but I’m really looking forward to hearing what they have to say in their masterclass workshops. We have also been able to bring together our local coaches and athletes in a learning and knowledge-sharing environment which is great for all members of our sporting community. This event is about opening up active sports to everyone. If you’re the person who’s been the supporter on the sidelines because you didn’t think you could participate, this weekend will help confirm that you can do anything. 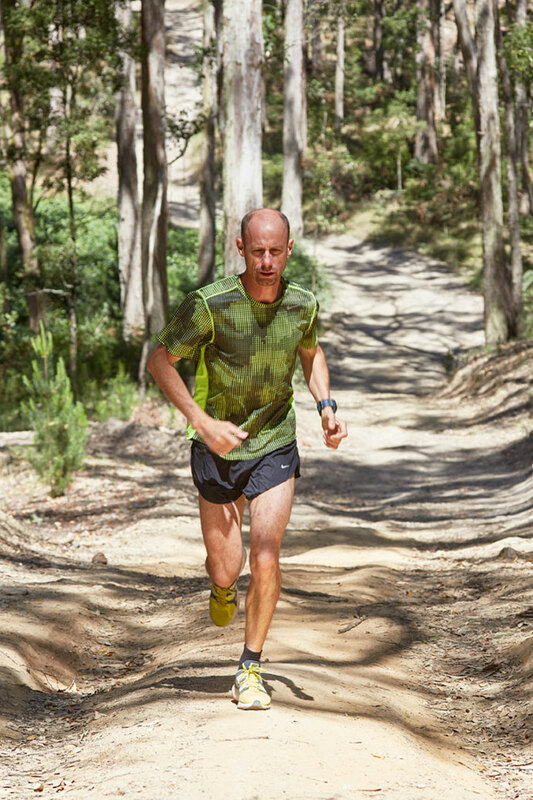 Steve Moneghetti will share his trail running tips. 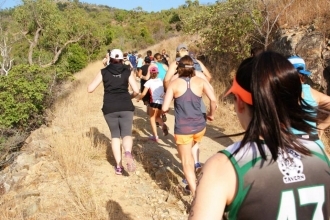 Do you think Magnetic Island — and Townsville — are ideal locations for people to explore activities like trail running, mountain biking and paddling? Absolutely! I think with Rockwheelers Mountain Bike Club doing such a fantastic job developing the local mountain bike trail network and Paluma Push numbers increasing and still selling out quickly; plus Outer Limits Adventure Fitness adding new trail runs to their popular series, and the NQ Ocean Paddle Series and Adventurethon getting bigger and better every year, it is clear that Townsville and Magnetic Island are great locations to get actively involved in the great outdoors! How will attending this session help Goers with their 2016 goals? The weekend is like a mini training camp for all three disciplines, so whether you plan to do them all or specialise in one, you’ll be able to gain knowledge and skills from expert coaches to set you up for the year. I like the quote: “If you can’t see it then you can’t be it”. Seeing how these pros train and prepare themselves will be invaluable for everyone attending. Is there anything else to add? We have limited the numbers for each activity because we want participants to have a quality experience with these amazing coaches to make the most of this rare opportunity. On Magnetic Island from Friday, February 12 to Sunday, February 14, a weekend pass to Destination Adventure is just $75 for adults and $50 for kids. Additional events are $25 per session. Fantasea Cruising Magnetic is running a special for the Destination Adventure weekend of only $99 return for a car and up to four passengers. With both Best of Magnetic and Peppers Blue on Blue having accommodation specials, it’s an affordable weekend getaway. 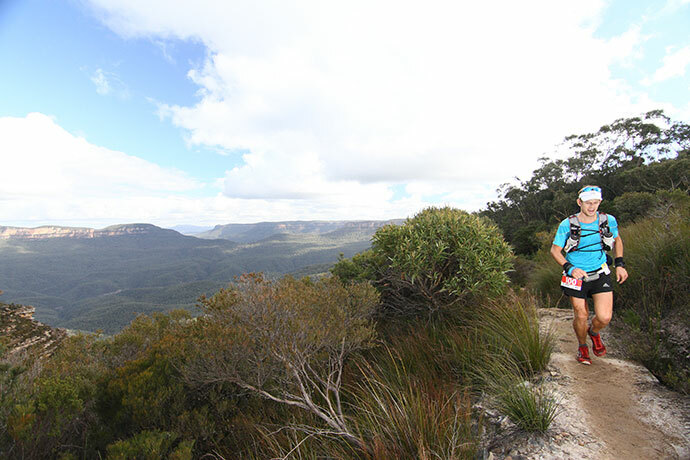 Find our more and secure one of the limited places here: http://www.mifitnesslife.com.au/destination-adventure.html.